Rouladen is the German version of the French roulade, which is a roll made with thinly-sliced meat. The German version is interesting in that it probably came from Germans using items they had on hand most of the time – mustard, pickles, onion, and pork – to make something that’s unique in its own right. What’s even better is that these characteristics also make it easy to throw together this delicious meal with items you probably already have in your kitchen. 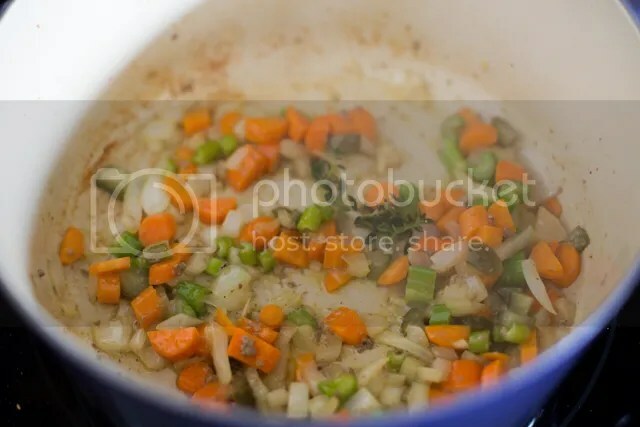 There’s no denying the French influence on this dish, with its use of a wine and broth braise (although Germans sometimes use beer instead) and mirepoix vegetables to add flavor. 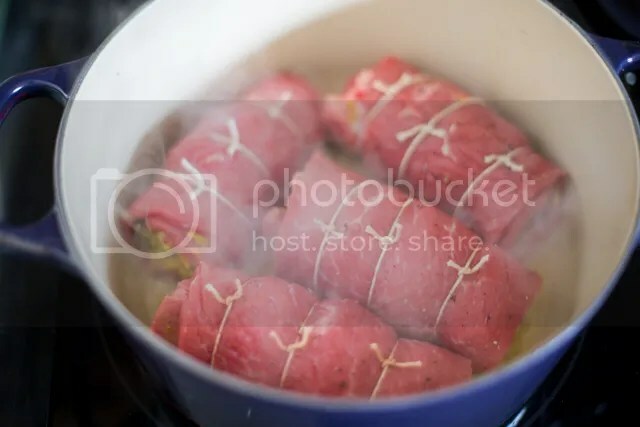 It’s commonly thought that Rouladen was originally made with strips of pork, although beef has become the most popular meat for this dish over the past century. When buying the meat for this dish, your local butcher may be able to slice it for you upon request. If you are slicing it yourself you may want to partially freeze it to make it easier to slice. You can also pound the meat to make it thinner or to a more even thickness. Lightly season it with salt and pepper on both sides. Many recipes call for sliced pickles and onions, but I found that chopping them makes the steaks a lot easier to roll. Chop up half the onion, pickles and bacon, then combine them to make the filling. Spoon some mustard onto one side of the steaks, then add some chopped onion, pickle, and bacon. Roll the steak and secure with either cooking twine or toothpicks. Don’t worry if you have leftover filling – we can use it in a second. In a dutch oven, heat the butter or ghee on med/high heat for a minute, then add the rolled steaks. Sear until browned, turning every couple of minutes. Remove the steaks and set aside. 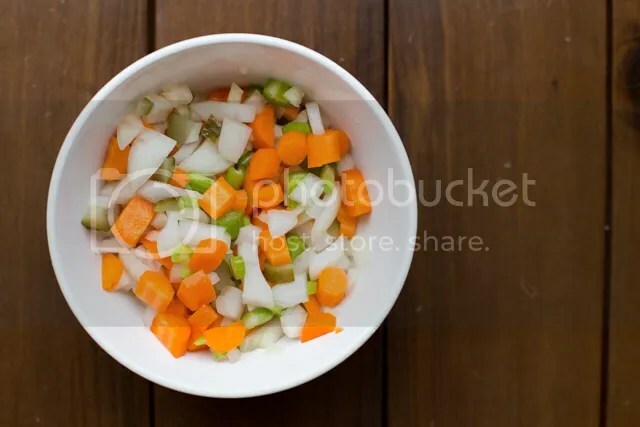 As the steaks are browning (or before) chop up a carrot, celery stalk, and the other half of the onion, then combine them with whatever filling you have left over. Add the chopped veggies and thyme to the dutch oven and sauté on medium heat for about five minutes, until the vegetables start to soften. Return the steaks to the dutch oven and add the wine and broths. Bring to a simmer then cover and reduce heat to low. Simmer for two hours, turning the steaks over halfway through. 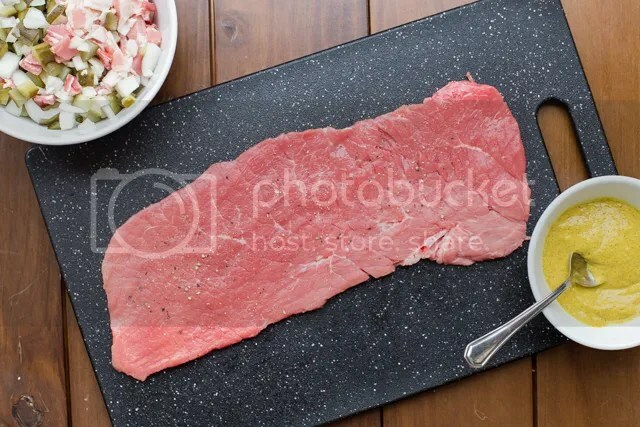 After two hours, remove the steaks and place them on a cutting board. Strain the sauce and discard the vegetables (they’ll be mushy at this point), returning the strained sauce to the dutch oven. Stir in the tomato paste and reduce the sauce on med/high heat, until you have about 1/2 cup of liquid left, about five minutes. Slice the steaks, then pour the sauce over the meat and serve. This dish is commonly accompanied with potatoes, roasted winter vegetables, cabbage, and red wine. I’M So Making This. THanks For BreakNg It Down. Far Less Intimidating This way! Any thoughts on pounding the steak thin like that? I have a heel of round roast sitting in the freezer too…any suggestions on a recipe for that or if it would work for this pounded thin? Meaghan, yes you can definitely pound the steak thin, that’s a common practice with some cultures. In fact, I’m going to add it to the recipe as a suggestion, thanks for reminding me! My this looks delicious-and with so much availability for creativity! One of the many things I want to try is this. Roulades are so pretty to serve and they photograph so well. Yours here looks delicious as well. Well done! Love this one. And it is certainly a nice way to make interesting a tough piece of meat. Plus, as you said, we can use things we already have in the kitchen. Great for having guests too :) thanks for the hint. I’m totally cooking it. I am a foodie. And this is SINFULLY delicious just to look at. I know I’m going to Hell. But Hell is a sacrifice I don’t mind making. I love rouladen; my mom used to make it in a very similar way! I am a born and Bred German Girl and grew up eating Rouladen 2 Sundays a month for most of my young life and into young adulthood…. It’s classic German comfort food….. My Mom passed away this past February, and I can still remember rolling them on our Family Kitchen table early on Sunday mornings, singing to her favorite Music….. <3 Such great Memories.. .and BRAVO on the recipe. Awesome and very Authentic rendition! As a Now Professional Chef, I commend your effort! Rock on…. This looks amazing. I have never had that before. I think this would be a nice meal for the family. Surprise them with something new. they like it when I find great recipes like this. Thank you for sharing! Hmm, looks delicious! Love the idea of it, just like the cordon bleu. Am I right? But I prefer this one. This looks delicious! Bookmarking the recipe–thanks for sharing! 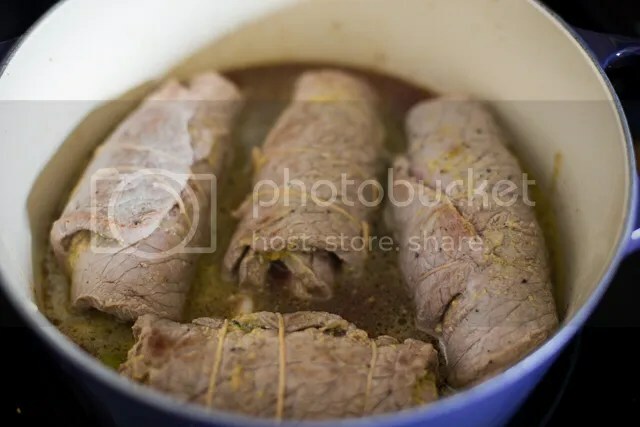 I’ve been making Rouladen for all of my adult life, my father used to make Rouladen. When I was a kid and I lived in Germany for four years. A simplified version is what we use, no chopping. A few thin onion slices and a dill pickle spear with a par cooked slice of bacon in each roll. Dredge rolls in gluten free flour and brown in olive oil. place browned rolls in baking pan. Deglaze browning pan with a cup or two of Beef broth. & a cup or so of pickle juice. Put rolls in baking pan, pour broth & pickle juice over rolls, bake covered with foil at 325 for 45 minutes, uncover and bake 10 minutes more, use pan drippings for sauce, thickened with a tiny bit of tapioca starch and serve with Paleo Pasta (I think from PaleoCupboard) – very much reminiscent of spaetzle! Instead of chopping pickles, I use the Vlasic Stackers. I love pickles, so this adds a nice amount of pickle to each bite. My German mother made this. She sliced the gherkin and onions rather than chop and also used a fine sliced rasher of bacon before wrapping up the meat. I have adapted the recipe – I add a slice of pimento and replace the bacon with parma ham. I also add lots of red wine, garlic and Worcestershire Sauce to the gravy which gives a touch of piquancy. Sometimes I cook extra shallots as well. Yum! Do you often eat white potatoes in your diet? I have wegener’s granulomatosis (vascular/autoimmune just like Tak) and I thought white potatoes are high inflamers? no? This with your roasted cauliflower made for an excellent Thanksgiving. Impressions were made. I am going to try this recipe today. I am using thinly slice rib eye steak. It will be so good. 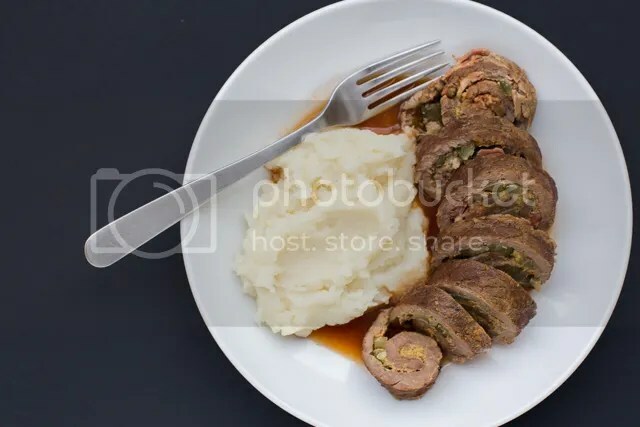 My grandma was from Germany and where she lived they made Rouladen and they used the same ingredients, however they went about it in a different way. 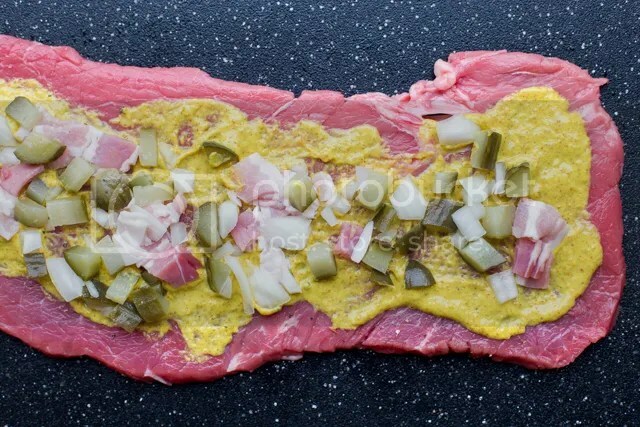 Inside the meat was a sliced pickle and a slice of onion, add a squirt of mustard and roll up, wrap a slice of bacon around the whole thing and pin with toothpicks. broil until bacon is crisp. Not only is the meat well done but the bacon adds a savory taste, you might try it that way sometime. Dave, that sounds awesome! Thanks for sharing. My German “sister” made this using a pressure cooker — 20 minutes gently rocking, turn off heat and let it come down slowly 10 minutes, before releasing pressure valve. Made the beef rouladen last night , excellent , thx a lot !